Monica Quesnell and Morgan Lea told us about the demons they have been fighting for portions of their lives and how it has affected their personal lives. Monica talked about the mental demands of her job in law enforcement that was slowly killing her, and that after working with a therapist and quitting her job to focus on her mental health, she is slowly getting better. Similarly, Morgan told of how memories of domestic abuse have led to difficulties in dating and trust, and that contracting herpes from a hook-up has not helped. Nevertheless, she’s slowly healing from past trauma, and to the surprise of some in the audience, Morgan still keeps in contact with her ill-fated hook-up. Going into a “Damaged Goods” StorySlam, I expected a few stories that involved car accidents. To my surprise though, none of our car-story tellers had stories about crashing their personal cars. As a kid, Michael Stodola and his friends would slingshot themselves out of his garage and into the street. One day, as his friend flung into the street he was hit by an oncoming car. He survived, but struggled in school and moved out of the neighborhood soon after. As a teenager, John Birdsall told of his dad angrily writing a letter to the head of Chrysler inquiring as to why his car had just suddenly stopped working. What he didn’t know though, was that John had taken it out for an intensive high-speed test drive earlier that day, which was apparently too much for the car to handle. Also a teenager at the time of her story, Patricia Daniels found her new car boxed into where she had parked earlier. Her plan to free her car? Put the car behind her in neutral and push it out of the way. Unfortunately, Patricia and her friend didn’t know their own strength and ended up pushing a stranger’s car down a hill and into another car. Before Jonathan West went off to college, he got a job as a handyman at a retirement community in Wauwatosa. One night, and after a few beers, Jonathan and his coworkers returned to the community at night and Jonathan tore down a brick wall on the premises. Unfortunately, when he returned to work the next day, he was singled out to pick up his mess. When Thomas Reder was Jonathan’s age, he left the church. Years later, however, when his desire to learn to fly found him in an airplane upside-down 5,000 feet above Washington County, he had his “come to Jesus” moment and has since found his lost faith. Our Audience Favorite’s story took place in one room. Or rather, one room and a piece of sidewalk. Jude Trede-Wolff was at her boring job after school, where she was lamenting to her coworkers about the class she had just failed, the classes she was about to fail, and the love that she would never find. As her friends were talking her up, she looked out the window and saw someone trip and fall on the sidewalk. After they picked themselves up however, they turned around, re-walked over the part they tripped over successfully, and then do a celebratory dance. Jude ended up passing her classes, graduating, and eventually found love again. Big thank yous to our season sponsors for helping put on this amazing event, and for Lakefront Brewery for hosting. 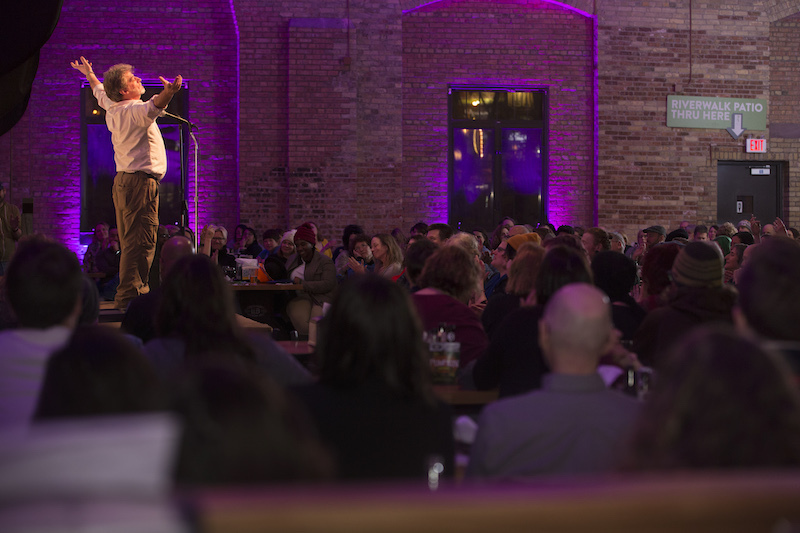 You’re invited to our next StorySlam: “What’s in a Name?” at Good City Brewing, 2108 N Farwell Ave, Milwaukee, WI 53202, Tuesday, March 26th, 2018, 7:30 – 9:45 pm. Reserve tickets HERE. See you soon!